This month, we were featured in The Guardian’s ’20 Best New UK Hotels and Hostels for 2018′ and we were thrilled to make the cut. The George Best Hotel was featured amongst some fantastic new venues including the Cow Hollow Hotel in Manchester and The Globe in Norfolk. Our plans to transform the Scottish Mutual Building into a luxury Belfast hotel were first announced last year. The George Best Hotel will celebrate the life and legacy of one of the greatest footballers of all time. We’re also looking forward to giving this iconic building a new lease of life as its doors open to the public once again. The Grade B1 listed building is visually striking and we feel it will make a breathtaking hotel venue. “The Belfast tourism market is at an exciting stage in its development and I am confident that this new hotel in the Scottish Mutual Building will bring something exciting and new to the city. As mentioned in The Guardian, our themed hotel is set to follow a similar format to that of Liverpool’s Shankly Hotel. Situated in the heart of Liverpool city centre, the luxury venue has become a local favourite for a luxury break and a tourist hot spot. In keeping with The Shankly, Belfast’s new hotel will showcase exclusive George Best memorabilia provided by the Best family. Over in our Liverpool venue, memorabilia is tastefully incorporated within the hotel’s Bastion Bar & Restaurant, offering day visitors and overnight guests a truly immersive experience. 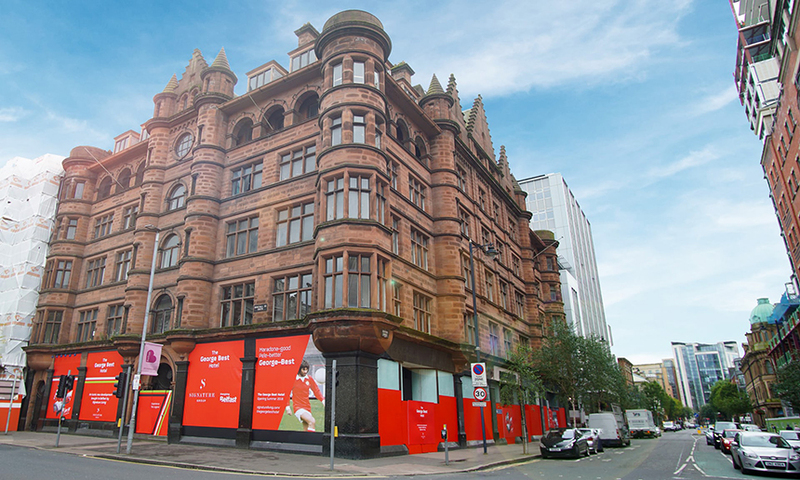 “We are delighted that George’s life and career are being honoured in such a stunning building and look forward to seeing it evolve into the George Best hotel. To keep up to date with the latest developments of The George Best Hotel, you can check out our Facebook page. We also recommend returning to our blog for exciting news and future offers.